In time for the tenth anniversary of its brief theatrical run, MVD has re-released the hip-hop documentary Freestyle: The Art of Rhyme. Viewed now, Freestyle pales in comparison to Doug Pray's similar and contemporaneous ode to hip-hop DJs, Scratch, but it still manages to be a fast-paced, highly entertaining portrait of rappers whose speciality is riffing improvised lyrics "off the dome." What Freestyle does extremely well is drop us into a scene-in-progress, presenting the energy and excitement that inspires hundreds of young people (mostly, but not entirely, males) to match their lyrical flow against their peers in competitive settings. The main event for competitive freestyle rappers is the rap battle, which entered mainstream pop culture thanks to the 2002 Eminem movie 8 Mile and resurfaces now and again thanks to clips of battling on Youtube. The film also highlights the freestyle rap phenomenon of cyphers, during which participants stand together in a circle and come up with impromptu rhymes that can get cut off or hijacked by someone else in the circle, if the rhymer starts to falter. Since cyphers can involve large crowds of mostly black and Latino young men standing around in public spaces, they are unfairly targeted by police, according to the film. To give Freestyle a sense of shape, director Kevin "DJ Organic" Fitzgerald highlights a few of the most respected freestylers and details some of the feuds that have arisen between them. When we are introduced to dreadlocked Brooklyn rapper Supernatural, he discusses reading dictionaries and rhyming dictionaries constantly to expand his vocabulary. He seems like a talented, likable guy, which makes it somewhat heartbreaking when he is later ambushed at a show by a rapper named Craig G, leaving Supernatural silent and steaming as his competitor turns the crowd against him. Eventually, Supernatural has his revenge on Craig G and is even shown later getting the best of another featured rapper, a Chicagoan named Juice, whose lyrics are so fluid that he is frequently accused of writing most of it in advance. While those vignettes provide the documentary with some drama, Fitzgerald hedges his bets with some star power too. He has interview footage and brief performance clips with Mos Def and Talib Kweli from Black Star; he even gets a shot of Mos Def trying out some rhymes in a cypher. He interviews Boots Riley of The Coup about why he doesn't freestyle and prefers to construct his rhymes carefully, instead of just "zoning out" and letting his mouth lead his brain. Fitzgerald even dredges up some old videotapes of stars like The Notorious B.I.G. 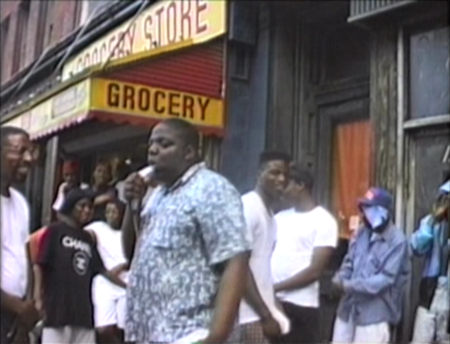 and two members of The Roots, all looking impossibly young, spitting rhymes on the streets. 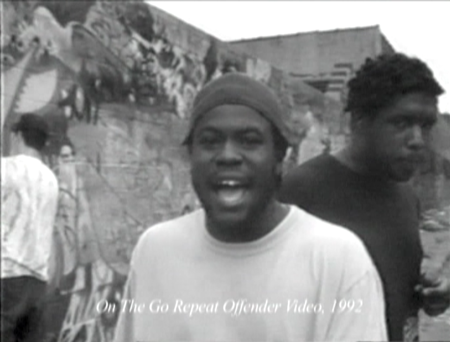 The Roots video is particularly fun, because it shows Questlove beatboxing and playfully pointing out random objects on the street for Black Thought to incorporate into his rhymes. While Freestyle is quite entertaining and perfectly nails down its time and place, there are two areas in which the film significantly stumbles. Whenever the film tries to bring in history or to speak the cultural impact of freestyling, it ends up playing like watered-down versions of stories and theories that have been told plenty of times before. The way that black cultural traditions and musical styles coalesced in The Bronx in the '70s into a new form of music-making is a fascinating story, but Freestyle's representation of that history -- even with new interviews with two members of the seminal proto-rap collective The Last Poets -- can't help but appear like the visual equivalent of a Wikipedia entry. Similarly, the talking heads about the cultural importance of freestyling are far less convincing and engaging than the footage of rappers actually performing. Freestyle is essentially a niche movie, but it's fun and accessible for curious outsiders too. Time will tell if it ends up having a lasting cult like the old-school hip-hop movies, Wild Style and Style Wars. I suspect not, but Freestyle shares the same time-capsule quality that makes those movies such fascinating documents. The standard 1.33:1 presentation is a dated-looking mixed bag of miniDV footage and 16mm film. Most of it looks fine for what it is, but it is apparent that this was a low-budget guerrilla production. The Dolby 2.0 stereo audio is functional without significant problems. Certain moments were clearly captured with the onboard mic on the video camera, so certain phrases get lost or garbled when the camera pans. Exclusive Freestyles and Interviews (31:39 total) - I have not seen the original 2005 DVD of Freestyle, so I don't know if "Exclusive" means that these clips are exclusive to this tenth-anniversary reissue or what. These bonuses are definitely more for hip-hop heads who are not just satisfied with the briefer clips provided in the film. It is interesting to note this section has some cypher freestyles from El-P, Aesop Rock, and Slug from Atmosphere, none of whom appear in the main film. Photo Gallery (1:27) - A musical slideshow. Freestyle isn't a big eye-opener as far as uncovering hip-hop culture, but it is still fairly informative while being quite fun to watch. Recommended.